LG reveals first prices for 2019 4K OLED TVs | What Hi-Fi? 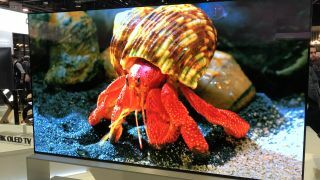 While we’ve known the details of LG’s 2019 4K OLED TV line-up for some weeks, pricing has been typically truant… until now. On LG’s US site, we've just spotted prices attached to its middle-sitting C9 and E9 4K OLED TV series, ranging from $2500 to $7000. The 55in C9 (OLED55C9) will cost $2500, while the 65in (OLED65C9) and 75in (OLED77C9) are priced $3500 and $7000 respectively. The superior E9 range, which continues LG's 'picture on glass' design, with slight refinements to the amount of glass on display and the speaker configuration used, is priced $3300 for the 55in (OLED55E9) and $4300 for the 65in (OLED65E9). Availability is expected to be in April (although pre-order doesn't appear to be open yet), and we hope to find out UK pricing soon. Naturally, this still leaves questions around the cost of LG’s Wallpaper W9 and entry-level B9 4K OLED TVs that top and tail the C9 and W9, as well as the prices of the 8K Z9 and R9 OLED models of course. While we can expect the B9 range to start around the $1800-$2000 based on the C9’s starting-from-$2500 pricing, it seems unlikely that it will beat – or even match – the juicy $1200 starting price of Samsung’s rival 2019 QLED TVs. Would that give Samsung an edge, with its entry-level QLED TVs bridging the gap between premium LCD and OLED sets? Perhaps. All we know is that we can't wait to get the 2019 TVs into our test rooms soon to see which OLED or QLED comes out as the best-value premium TV of the year.